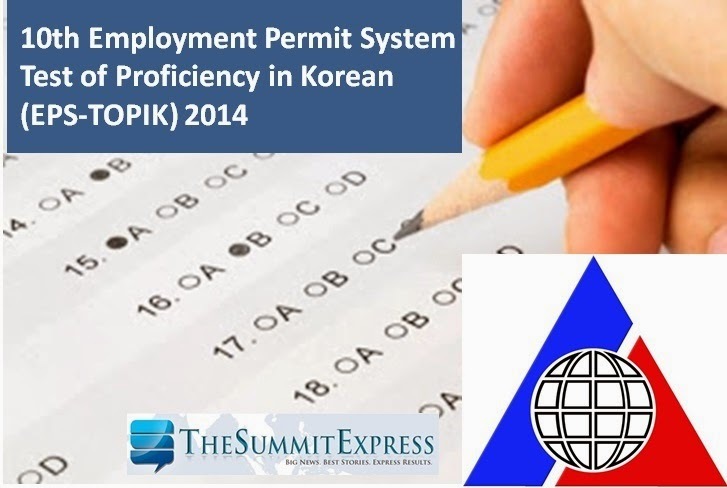 Manila - The Philippine Overseas Employment Administration (POEA) announced the conduct of 10th Employment Permit System - Test of Proficiency in Korean (EPS-TOPIK) on June 29, 2014 for Paper Based Test (PBT) and July 3-20, 2014 for Computer-Based-Test (CBT) in various testing centers nationwide. The schedule of registration for those who have responded to the POEA online survey on EPS-TOPIK is now available online. Register for the 10th EPS-TOPIK from April 21 (Monday) - April 25 (Friday), 2014. Registration starts at 9:00am to 5:00pm. Note that registration date and session are individually assigned by POEA. Applicants should strictly follow the schedule assigned due to limited registration period and capacity of the registration venue. Only those who responded to the POEA online survey on EPS-TOPIK can register for the 10th EPS-TOPIK. EPS-TOPIK Registration Application form (To be distributed at the registration venue). Application numbers are written on each application form. Each applicant receives and submits one application form only, use correction tape in correcting errors. Valid passport (a copy of passport must be attached on application form.) No valid passport, No registration: Only applicants with valid passport will be allowed to register for the test to avoid discrepancy in their personal information later on. If an applicant’s personal information on the passport is not exactly the same as the one on the application form, his entry to Korea will not be permitted in any case, and the applicant is fully responsible for any problem caused by such differences in the personal information. HRD Korea will use the personal information (name, date of birth, and gender) written on the application form and the applicant’s photo attached on the application form for future employment in Korea of the workers, and these are not changeable in any case. POEA said that allocated list of test takers will be announced on May 23, 2014. All applicants of 10th EPS-TOPIK can only choose ‘Manufacturing’, for selection of the type of industry. Choice of other type of industry is not allowed. EPS-TOPIK exam is composed of reading and listening. All of the questions are to be taken from closed question bank based on “The Standard Textbook for EPS-TOPIK” which can be downloaded from the HRD Korea and POEA websites. POEA said that passing the EPS-TOPIK only gives the workers the qualification for EPS job application and does not guarantee employment in Korea. Moreover, persons who are restricted from employment in Korea, such as those who do not pass the medical examination or who have the record of illegal stay in Korea, cannot be employed in Korea. The official exam results of 10th EPS-TOPIK will be released on Tuesday, August 5, 2014. Applicants who will take the CBT in Metro Manila, July3~28, 2014 will be included as 10th EPS-TOPIK batch. Therefore, they can check the test result on the same day as PBT taker’s test result date. TheSummitExpress.com will update this page for the results of exam once officially released online. Follow Us on Twitter or Like Us on Facebook to receive more updates about 10th EPS-TOPIK. You may subscribe also to our RSS Feeds.